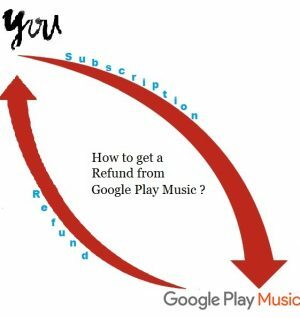 Online Music Store How To Get A Refund From Google Play Music Services? From all corners of the world,Google has made quite a reputation. Having penetrated most parts of the globe, its services come with a promise. Google Play Music tends to entertain music fans with a huge catalog of tracks. However, sometimes you might accidentally buy something or get a track that’s not playing or streaming. •	Go to your web browser and open https://play.google.com/store/account enter your account details if requested to. •	Search for your order history and find the order you want to return, and if you don’t find the order listed among the others in your purchase history, it means you bought it using another account. Switch to the account and proceed. •	On the right side of the order, there are three dots, a symbol for more. Click on the three dots to reveal a series of options. •	Select report a problem and go ahead to pick an option that matches your situation. If it’s not there, go for the one closely related. •	A message will appear on screen “thank you for your concerns,” then wait to get an email withan approval. It will only take 15 minutes, but it can also take up to two days of business. •	Open a web browser on your tablet, computer, or phone. •	Copy https://play.google.com/store/account then paste it into the internet browser. Make sure you paste it into the address bar and NOT the Google Play Store app because you cannot request a refund here. •	Scroll down to order history and follow the procedure detailed above. However, if you have several items to refund for a refund, follow these steps on each item. iPhone and iPad happen to follow the same process as for the Androids. If you live in the European Union, you have 7-14 days to request a refund which will be approved if the song purchased is technically inadequate which only means you haven’t been able to download or stream the track. 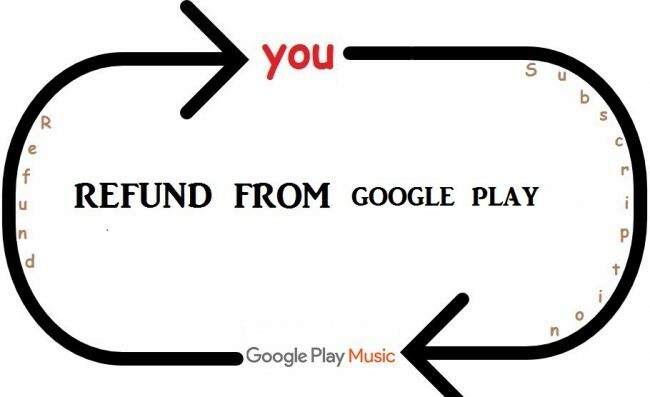 However, if the song in question has already been downloaded, streamed, or played, Google has every right to charge you because the purchase completes once you play, stream or download successfully. •	Open your web browser and look for your play store account. Enter your login details to access the page. •	Your order history will bring forth the track you want to return. So, open your purchase history. •	A report a problem option will be visible for you to select. •	Since you want a refund, I suggest you specify with the I’d like to request a refund option. Submit and wait for an email approving your request. Alternatively, contact Google support team, and unless you abuse their system with false requests, your refund will go through. Assuming your kid accidentally filled the cart, and you happen to realize it, you can get a refund, but if the request is sent months after the purchase, that’s on you. To avoid this, put your phone on child lock if you can’t help but leave it lying around. Also, lock it when you put it in your pocket or buy a screen protector. Google has improved security over the years, and you can set your app in such a way that every time you make a purchase, a password has to be typed in to complete the purchase. •	Search for require authentication for purchases option. Usually, it’s really important to be polite, honest, and patient when writing a refund a request. It would do you any good flying insults because you are disappointed. It’s within your rights to demand a refund if the item in question wasn’t what was promised, it’s damaged, or you never received it at all. A follow up is made after you request goes through to make sure the problem really exist. A refund is processed after and each party remains satisfied. In the case of a hack, a refund will still be processed but make sure to report as soon as you come across suspicious purchases. Your account will be temporarily stopped and once you are up and running again, request for new login account details. All in all, Google Play Music is dedicated to delivering the best, and if you have a problem, they are eager to make peace. Understand the precautions the precautions in place for refunds. They safeguard your interest and that of the company.